Use the configuration wizard to create the Service Analytics app. Describe how changing answers to wizard questions affects the app and its dashboards. Explain how to use a lightweight, iterative approach to creating Service Analytics so it meets your business needs. Stop! If you haven’t completed Get Started with Service Analytics, do that first! In that unit, you sign up for a special Analytics Developer Edition org, which you must have to complete the rest of the Service Analytics Trailhead module. If you’ve previously set up a Developer Edition org for another trail, it won’t work with Service Analytics. Log in to the org that you just set up in the last unit, Get Started with Service Analytics. Click the app launcher ( ). Click the Analytics Studio tile. Now create the Service Analytics app. 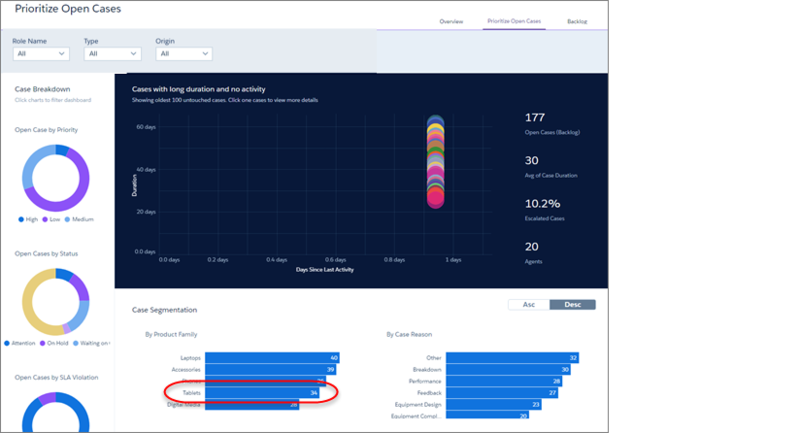 Service Analytics for Trailheadand select it. Click Continue. Be careful to select only the app called Service Analytics for Trailhead. Otherwise, the app you create won’t coincide with the instructions in Trailhead. Have a quick look at the app preview page. When you’re done, click Continue. This kicks off the compatibility check that makes sure your org has all the data needed to create the app. We’ve set up your special Developer Edition org to be sure it has all the right data. (When you create Service Analytics in your own org, you might see error messages with instructions on how to fix any issues.) Give the compatibility check a few seconds to run. Then click Looks good, next. Select Custom, and click Looks good, next. Look at the first page of the wizard, which is all about metrics you use for support cases. The questions in the wizard you see in Service Analytics in your own org may differ from the ones shown here. We periodically update wizard functionality in response to you, our customers, tell us you need. Read the first question, “What primary field do you use to track case duration?” Sounds important since one of the KPIs you’re looking for is case duration—that is, how long it takes your team to close cases. It goes on to tell you to leave the field blank if you don’t have a custom formula field for duration. The admin confirms that a custom formula for Service Cloud data was never created, so you leave that and the next question blank. 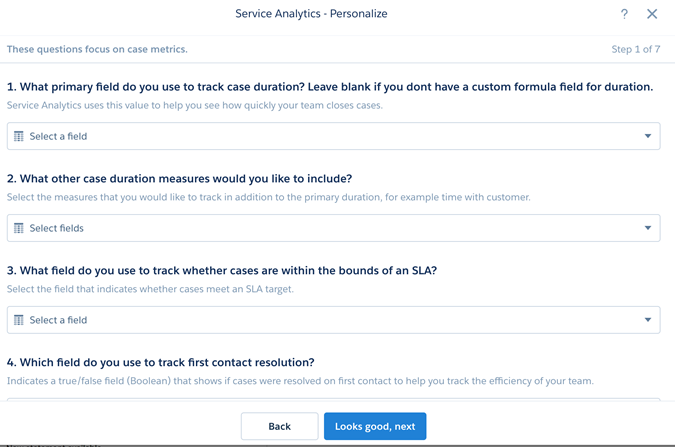 Just so you know, Service Analytics calculates case duration for you if you don’t create your own formula. If the case is open, it calculates the period between the case creation date and today. If it’s closed, the app uses creation and close dates. Now look at the question, “What field do you use to track whether cases are within the bounds of an SLA?” Look through the possible answers. Many don’t make any sense in this context—Contact email, Customer emoticon, Old Description, and so on. Keep going until you find one that’s appropriate. Near the bottom, you see SLA Type. That makes some sense, because it refers to SLAs. But you want a field that indicates if the case is within the bounds of an SLA—not the type of SLA that covers it. The admin tells you to select SLA Violation, which your team uses to indicate if a case has not met the terms of an SLA. Scroll down the page to “Which field do you use to track first contact resolution?” Look through the answers, and notice that most are obviously wrong. Select the clearly right one, First Contact Resolution. The last question asks you about your fiscal year start date. Notice that it has a red asterisk (*) next to it, which means the question requires an answer. The default, January, happens to be the month DTC uses. Leave it as is, and click Looks good, next. That was straightforward. You’ve seen that the wizard takes care of a lot of the work for you with default answers. When you need to select values, the choices are mostly obvious. The admin was right—not too hard. Together, you move on to the next page. The first question, “What field do you use to track the status of a case?” has an asterisk next to it and requires an answer. The answer field has been prefilled with Status (the default value and, by chance, the one DTC uses). So this question doesn’t require action on your part. Move to Question 2. It asks about the field you use to record support level. The answer field says Select a field—it has no default. Select SLA Type. Go to the question, “What field do you use to identify the product associated with the case?”, which also requires an answer. You see both Product and Product Family. The admin knows that DTC has so many individual products. But viewing cases by each one would give you much too detailed a view. Select Product Family to look at cases according to more digestible categories. Scroll down to “What field do you use to view data by geography?” The wizard’s asking you to indicate the field from the Account object (the answer to the question just before it) that you use for geography data. Several answers make sense—Account Address, Billing City, Billing Country, and so on. Your admin happens to know that you use Billing Country, so select that. You don’t see any more questions with asterisks requiring that you answer them. But the admin stops you at Question 10, “Do you use the record type field to distinguish your cases?” The admin tells you that the record type field hasn’t been enabled in your org. Because DTC doesn’t use record types, make sure you change the answer to “No.” Remember that if you say “Yes” and your org doesn’t have that kind of data, dashboards fail. So select “No” here, too, because DTC doesn’t use queues. Click Looks good, next, and move to Page 3. Looking through Page 3, you don’t see any asterisks. What a relief—no more required answers, so maybe you’re done. But not so fast! Next, the admin draws your attention to Question 2, about CSAT score. “The default is ‘Yes,’ and that’s crucial. When I was experimenting earlier, I tried setting it to ‘No.’ Big mistake, because I didn’t get customer satisfaction data in our dashboards.” The admin tells you to remember that. Leave the answer “Yes,” and move on. Question 3, which asks if you use knowledge in your support process, also warrants a close look. The admin explains, “We’re not tracking use of knowledge articles in the support process at the moment. If we did, we’d say ‘Yes’ here and Service Analytics would put up a new wizard page to get more detail.” You leave the answer as “No,” per the admin’s instructions. Next up: Question 4, about telephony. The admin explains that’s another important question to leave as “Yes.” Changing it to “No” means Service Analytics doesn’t show key metrics about how the team handles support cases over the phone. The admin confirms that rest of the defaults are fine, he says, although as you get more into Service Analytics you can revisit them. But that’s for another day, and you move on to Page 4 by clicking Looks good, next. “Remember we said ‘Yes’ to the question about CSAT score on the last page?” the admin asks you. “Well, we have to be careful here to get that data to come out right in our app.” Notice that the default answer to Question 1—“What object do you use to track customer satisfaction?”— is Case. Many companies create a custom object for CSAT data. It’s common to use an external tool to gather and store CSAT data and then import it to a custom Salesforce object. DTC happens to use a custom field in the Case object to store CSAT data gathered from its survey tool—so leave the default as is. 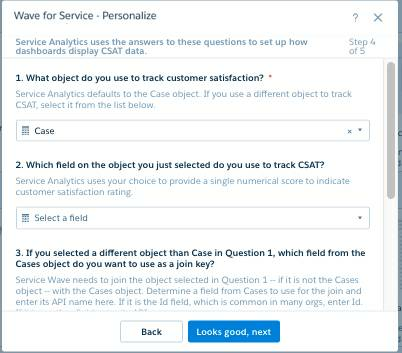 Move to Question 2, “Which field on the object you just selected do you use to track CSAT?” Select the custom field from the Case object where you store CSAT data. The admin explains that choosing the correct field here is the key to making CSAT data come out right. The admin tells you that it’s the CSAT field, so find and select that. Questions 3 and 4 need answers only if you selected an object other than Case in Question 1, so you don’t have to answer those questions. The admin tells you to click Looks good, next to move to the last page of the wizard. The first thing you notice is that you’re looking at Page 6. “Should this be Page 5—did we make a mistake?”, you ask the admin. He reassures you that everything is OK. “Remember we said ‘No’ to the question about knowledge? Page 5 would have come up if we’d said ‘Yes.’ But we said ‘No,’ so we’re good.” There’s only one question on the page, about the maximum service time agents should keep customers waiting during a call. You know DTC’s standard is 30 seconds, so type that into the answer field and click Looks good, next. The next page asks if you want to verify that your org’s data meets the requirements to create an app. The admin tells you “I’ve already validated that we have the right data, so let’s select ‘No.’” You do that, and click Looks good, next one last time. In your own org, you’d probably want to answer this question with a “Yes.” Running the scan can save you a lot of trouble by pointing out any data fixes you need to make so you can be sure your app gets created without errors. 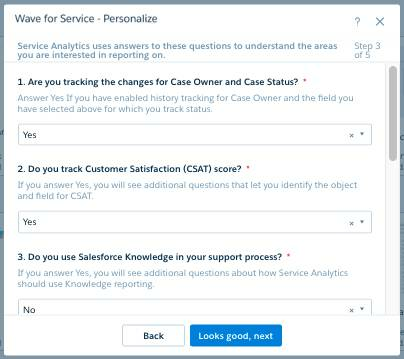 The admin explains that if you tracked CSAT in a separate object, as a lot of support organizations do, Service Analytics combines that data with Case data based on questions 3 and 4 on page 4. 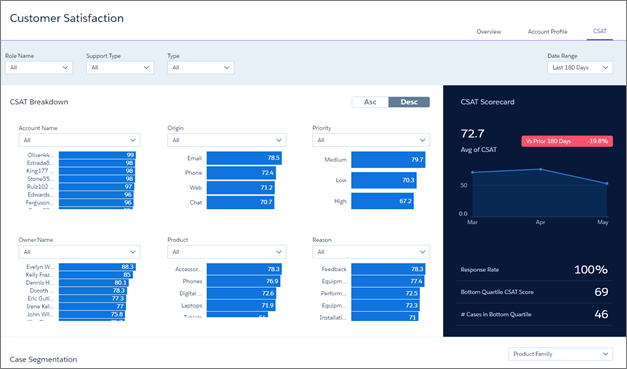 While Service Analytics creates your app, you decided to read more about CSAT metrics setup and the rest of the wizard in Salesforce Help. (See the links at the bottom of this unit.) And before heading to the coffee machine, the admin promises to text you as soon as the app is ready. We interrupt this unit with a one-time-only set of instructions that you must complete to get the special Developer Edition of your app working correctly. You just created your Service Analytics app. Now it’s time to run the Trailhead Data Manager, which we introduced in the Analytics Apps Basics module. For Trailhead only, this step brings the right data into your app so you see meaningful data in dashboards. Be sure you can see the dashboards for your app before running the Trailhead Data Manager. Also, you only run the data manager in Trailhead. You don’t use it to set up Service Analytics in your own org. In Analytics Studio, click the app picker at upper right and select Trailhead Data Manager. You may have to scroll down to find it. 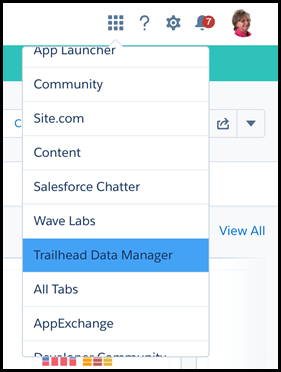 On the next page, select the Trailhead Data Manager link below Items. On the Trailhead Data Manager home page, check if you need to refresh your data. If the page says that your data is up to date, you’re all set. If the page says that your data is not refreshed, click Refresh DTC Data. Refreshing the data can take a few minutes. That’s it! We now return you to your regularly scheduled programming. Coffee break’s over! You’ve created your first Service Analytics app and taken care of the Trailhead-only steps to make it work like a real app. Extra kudos! Now let’s see what you’ve accomplished. Once the Trailhead Data Manager’s done, select Analytics Studio from the Salesforce App Launcher. Look for My First Service App in the Apps section of the page, then click the Run App tab to the right. 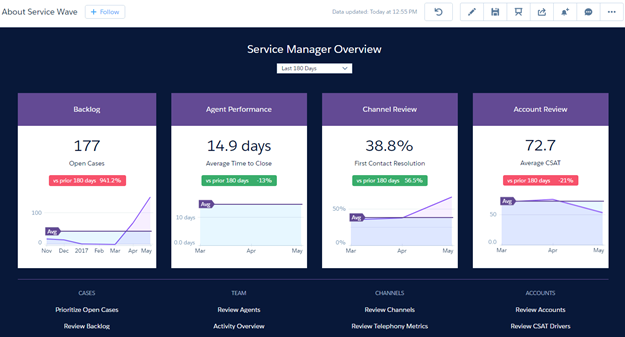 Cool—the Service Manager Overview dashboard! Ready-made, and waiting to help you to get on top of your service business! Don’t worry if your dashboards look a bit different from the examples here and elsewhere in the Service Analytics App module. The basic elements of the dashboards should be the same even though the data might differ. Remember that at the outset of this module the sales VP approached you to ask for help understanding customer issues with the new DTC Electronics tablet. You and the admin focused on getting the CSAT data correct, so you immediately want to see data about tablet support and CSAT numbers. The overview dashboard shows you that and more. You see the size of the backlog, your agents’ average time to close cases, and changes in first contact resolution data. You also see trends for these metrics compared to the average for the date range selected in the filter at the top of the dashboard. What can you do with the data you see here? Let’s explore a bit! Just under the dashboard title, click Last 180 Days to open the time period filter and select a different period. See how all the metrics change? So much control right at your fingertips. Now look along the bottom. The links take you to the rest of the app’s dashboards—where you can review open cases, agents, the backlog, channels, and so on. Make a mental note of these links, since they’ll come in handy later. The overview dashboard is a great entry point to the rest of the dashboards. You can always come back to it when you’re not sure where else to go. Look at open cases by clicking Prioritize Open Cases. On the Open Cases dashboard, locate the By Product Family widget under Case Segmentation. (Remember selecting Product Family when you created the app?) Click the tablets bar, and the dashboard redraws to show you just open cases for tablets. Cool, just what you were looking for—data about open tablet cases. We’ll come back to that one later in the module. For now, click Overview at top right to return to the Service Overview dashboard. You wanted to be sure you could see CSAT data. Right under Account Review you can see your team’s average CSAT score. But you want a bit more detail. Click Review CSAT Drivers at the bottom right. Check out the Customer Satisfaction dashboard, which just opened. It shows a breakdown of your CSAT averages by account, origin, and so on. You can review how CSAT has changed over time, how CSAT relates to case duration, and more. Your quick review tells you enough. Your work with the configuration wizard—not to mention all the help you got from the admin—paid off. You have what you need to support the tablet launch. What’s more, you have a great tool to stay on top of your entire service business. You can start rolling it out to the team right away! Remember how you used to do analysis? Dull spreadsheets that were hard to create and harder to work with, with few visuals. 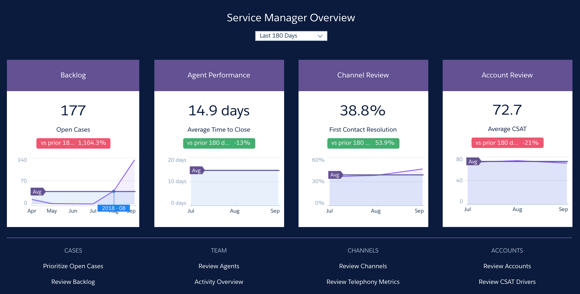 But with Service Analytics, you and the team have all your service KPIs in a single place. They display in dashboards that show you what you need to know quickly. Before, you had umpteen reports and dashboards for each product, region, customer group, support team, and so on. Now, you have a few dashboards that you can filter by any aspect you need to know about. And all it took was getting a few answers right in the wizard. You’ve barely scratched the surface with the app, but you’ve already seen lots of great dashboards in so little time! You’ve gotten this far this fast, so you’re excited to jump into the app and really get to work.